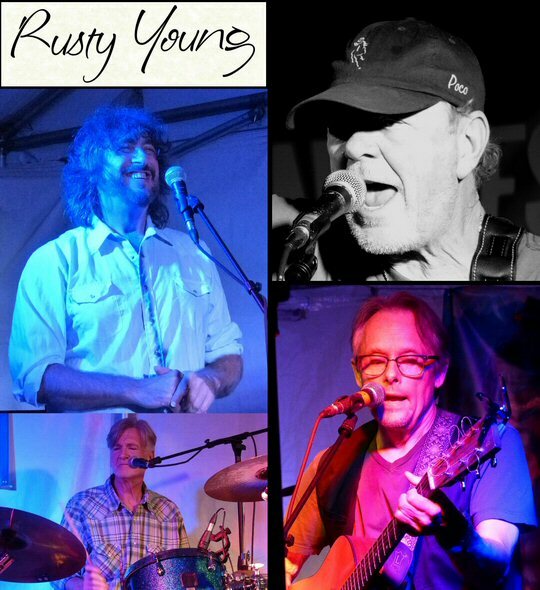 Rusty Young is best known as the singer, songwriter and fiery pedal steel guitar player for the country rock legends POCO. In fact, come next year he'll have held this position for 50 remarkable years. Young gave the band their first long-awaited hits in the form of "Keep on Tryin' " and "Crazy Love". Earlier in the decade he floated the idea of retiring from the road but now he's gone and done the complete opposite by launching a solo career with a debut album called Waitin' For The Sun out now on Blue Elan Records. Rusty Young and POCO at The Filming Station in Nashville. We caught up with Rusty and his POCO mates on September 15, 2017 when the boys headlined a unique early evening event at The Filming Station featuring Blue Elan artists Rusty Young, Jesse Dayton, Rod Melancon and Chelsea Williams. This very special showcase and record release party was open to the public as a free add on to this year's amazing AmericanaFest in Nashville, Tennessee. MCN founder Rich Lynch has been a fan of POCO for a long time thanks to his older brother Dan's obsession with the band since 1970 that turned a little more personal following a 2002 post show interview in Albany, New York with principle members Rusty Young, Paul Cotton and George Grantham. 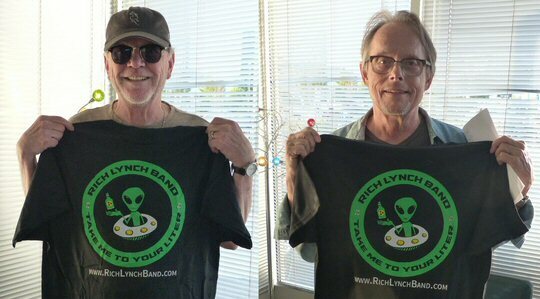 We've been following the modern day incarnation of POCO with extreme interest ever since so it was a thrill for Rich Lynch to see Young and bass player Jack Sundrud again in Nashville prior to the concert where he gave them both T-shirts promoting his own Music City based recording project. Produced by Rusty and longtime POCO bassist/vocalist Jack Sundrud the recording's 10 songs first came together in the hours just before dawn. "I live in a cabin that overlooks the Mark Twain National Forest in southern Missouri, and got in the habit of waking early to watch the sun come up," Rusty explains. "Just sitting there with my guitar, loving where I live and thinking about how far I've come and how lucky I've been. After a while, the songs just poured out of me." The album was recorded at Cash Cabin in Hendersonville, Tennessee, the former home recording studio of Johnny Cash and June Carter Cash. "June's old piano is all over the record," Rusty enthuses, "and I got to play Johnny's '57 Les Paul." Rusty also played steel and acoustic guitars, dobro, mandolin and banjo, with the current configuration of POCO - Sundrud, keyboardist Michael Webb, and former Flying Burrito Brothers drummer Rick Lonow - filling in the rest. Rusty Young and Jack Sundrud were out of this world at AmericanaFest. Rusty and the band he calls "quite simply, the best musicians I know" took the stage at The Filming Station and proceeded to rip through a balanced set of POCO classics and new numbers from the solo effort. With retirement now in the rearview Rusty is looking forward to touring in support of this new disc as well as playing a series of special concerts to celebrate POCO's 50th anniversary. Most of all, he's enormously proud of an album that has been, in a sense, 50 years in the making. "I've been fortunate to have had a magical career," he admits. "From the moment I was called to play on the Buffalo Springfield album, all through POCO and now to this solo project, things have just fallen into place. I've worked really hard to be the best I can be, and I think this album is the proof." Opening the show were Chelsea Williams who provided a pleasing acoustic set featuring tracks from her new Boomerang album. Rod Melancon captivated like a Bob Dylan from the Bayou as the Louisiana native charted a narrative with songs from his Sothern Gothic record. Jesse Dayton had the job of charging up the crowd before the main act and his rockabilly trio were up to the task as they powered through selections from his The Revealer that revealed them to be surprisingly heavy and a little dark but thoroughly enjoyable. About Blue Elan Records and AmericanaFest: Blue Elan is an artist-friendly label that brings expertise, perseverance, and a long history of working with talent together in an environment that fosters creativity on the artist's terms. Their mission is to provide a path for artists to create without interference and give them the tools to succeed in today's music business. 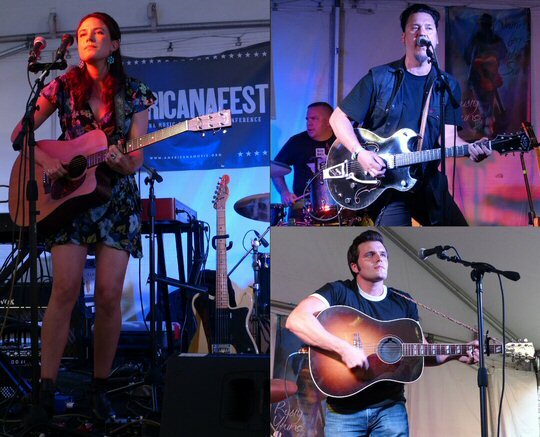 AmericanaFest is an annual multi-day event that brings together fans and music industry professionals alike offering a celebration of the hard to classify and often eclectic genre of Americana music. This is achieved through seminars, panels and networking opportunities by day and raw, intimate showcases each night. Blue Elan artists Chelsea Williams, Jesse Dayton and Rod Melancon.